Something is changing while I do’nt realize. What is there under that cloud? What is there over that ocean? A dream is coming slowly from over that ocean….. 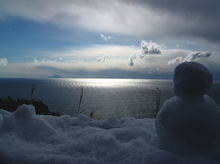 This entry was posted in nature, Sea on 2006年2月6日 by izusakuraya.